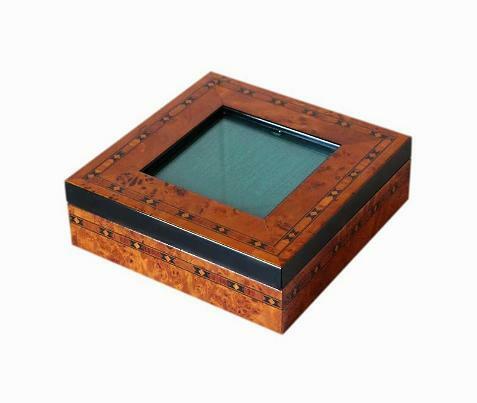 This is a beautiful modern jewellery box with a lovely glass panel for displaying a photo. This box has a beautiful burl wood veneer and decorative inlay to the lid and all sides. The edges and sides have a dark ebony effect and all of the wood has a glossy polished finish. The lid has a stylish inset glass panel and a photograph of a loved one or pressed flowers can be placed here. The box has brass 'stop' hinges which hold the lid upright at a 90 degree angle. The bottom of the box has a black soft felt covering which will protect the surfaces of furniture. 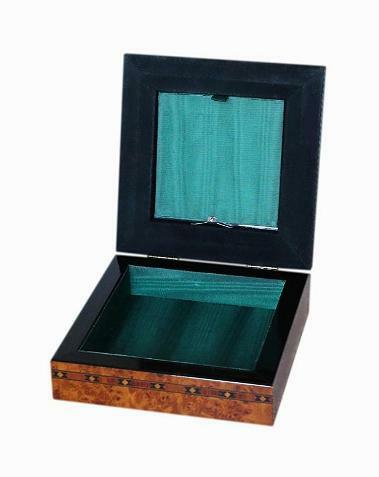 The interior has a single storage compartment which is lined with high quality watered silk. The backing to the display panel has a matching silk covering. There is a metal catch to the backing of the display panel which holds it securely in place. The backing has a pull tab which allows you to remove it with ease. There is a black felt finish to the wood surrounding the backing. This matches the felt on the bottom of the box. This very stylish box is in excellent condition. There is minor wear to the felt covering on the bottom of the box. 11.0cm square with a 2.5cm depth.